The Southern Vegetarian Chronicles: Something vegan and yummy for breakfast! My dad makes a great bowl of oatmeal every morning with raisins, craisins, pecans, (from Louisiana of course), and uses apple juice to sweeten. 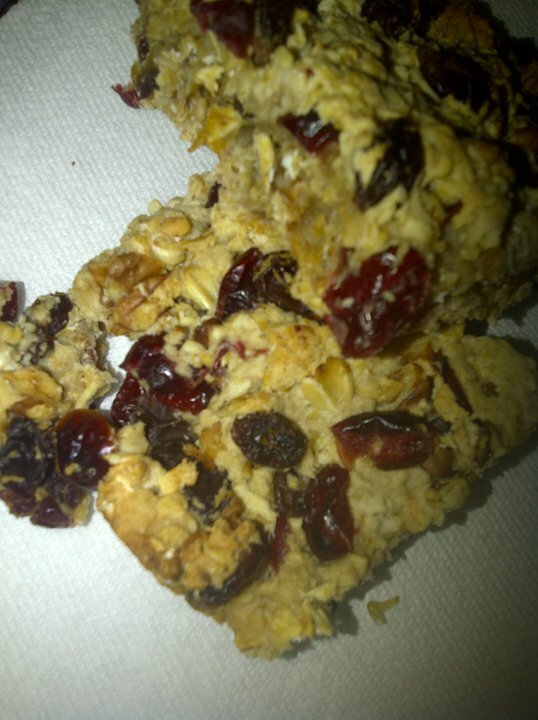 So I thought I would make his tasty oatmeal into a breakfast bar. It's great on those late mornings when there is not enough time for cereal or anything for that matter. I added granola and a touch of agave for added crunch. Check out the recipe below and enjoy! Oil brownie pan or 8x8 baking dish. Mix flour, granola, oatmeal, and pinch of salt into a bowl. Chop nuts, raisins, and craisins together and add to bowl. Add the 1/8 cup of melted Earth Balance, apple juice, and agave to flour mixture and mix with spoon, then, use hands to finish mixing (have fun with it!). When everything is fully incorporated press mixture into dish and brush tops with the remaining melted Earth Balance. Pre-cut squares before baking. Bake for 25 to 30 mins. Let cool completely before separating and enjoy!